Europe awaits for Rob Baxter and his Exeter Chiefs side, but they will head into this season’s Champions Cup brimming with confidence after a nigh-on perfect performance so far in this season’s Gallagher Premiership. Six wins from six, 29 points out of a possible 30, Devon’s finest are in decent shape as they brace themselves for upcoming heavyweight match-ups against Munster and Castres. Ahead of those meetings, however,they first had to overcome the stiff challenge of local rivals Bath on their own turf. For much of Exeter’s early existence in English rugby’s top flight, it was Bath who were deemed the arch nemesis of Baxter and his troops. Countless battles came and went, before the Chiefs finally broke their duck. In more recent times, it’s the Chiefs who have held the upper hand and they triumphed once more in this latest meeting, securing a fifth bonus point win of the season thanks to tries from Stu Townsend, Don Armand, Matt Kvesic, Ian Whiten and Jack Nowell. Playmaker Gareth Steenson weighed in with the remainder of the points, his 14-point haul taking him to another milestone, this time the Irishman passed 1,500 Premiership points. For an hour, Bath were very much in the contest. However, when push came to shove, they struggled to contain their visitors.Rhys Priestland and Chris Cook grabbed a try apiece, while Freddie Burns added 19 points with the boot. With an unblemished record after five games of the season, Baxter again rotated his playing options for the short trek to the Roman City. Some were enforced following the news earlier in the week that both Jonny Hill and Sam Simmonds are both set for lengthy spells on the sidelines, while others were more routine. Back into the fold came a new-look front-row of Ben Moon, Luke Cowan-Dickie and Harry Williams and they were joined in the pack by the returning Sam Skinner and Armand.Behind, Townsend took over at scrum-half, while Henry Slade and Phil Dollman added their silky prowess to the visiting line-up. Bath, meanwhile, were much changed from the side that lost at Saracens. Kiwi Director of Rugby Todd Blackadder had decided to make wholesale changes for the clash with the defending champions and it was only Charlie Ewels, skipper Priestland and Rokoduguni, who were kept in the home starting XV. On a perfect night for rugby, the opening exchanges were largely restricted to a game of kick tennis as both sides looked to gain the territorial edge. It was the Chiefs, however, who had the first real opening of the game on nine minutes. Some heavyweight carrying from the visiting forwards saw them punch significant holes into the Bath rearguard, but just as they looked to deliver the telling blow, it was No.8 Kvesic who was penalised for holding on just yards from the home try-line. 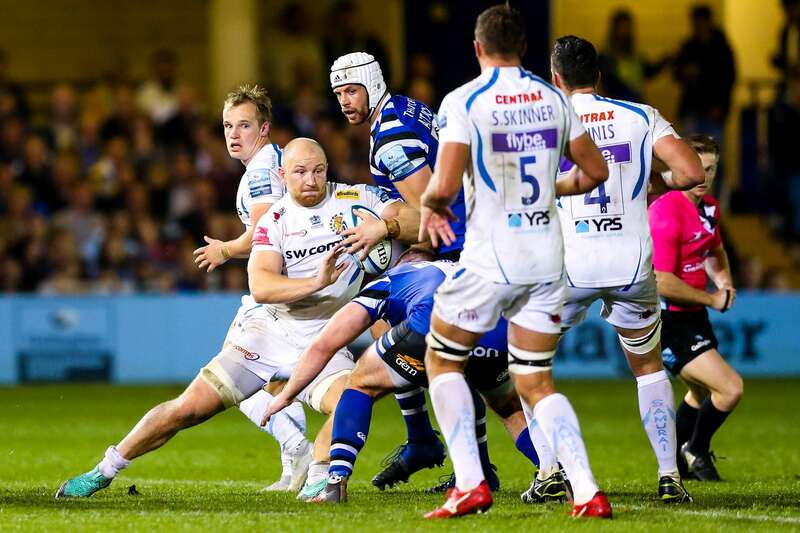 Bath made the most of the let-off and just moments later they broke the game’s deadlock when Burns - shunted to full-back for the night - slotted a routine penalty after Exeter prop Williams was adjudged not to have rolled away at the tackle. Blackadder’s side were certainly looking lively and were handed another good attacking opening shortly after when Priestland drilled a penalty to within metres of the Exeter line. The hosts, however, could not capitalise as Skinner picked off the set-piece, allowing the Chiefs to clear the danger. It was proving a captivating contest as Townsend threatened at the other with a clever chip-and-chasein behind, before Bath added to their tally with a try virtually out of nothing.Making the most of turnover ball, they worked the ball to the right flank to Semesa Rokoduguni. 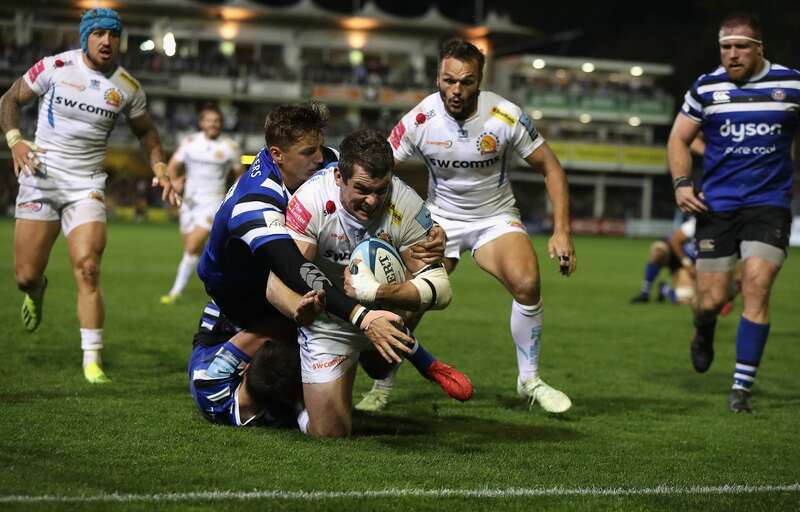 As the Chiefs flew up in defence, the England International chipped the ball in behind, providing the perfect set-up for fly-half Priestland to gobble up the ball and race in under the sticks. Referee Christophe Ridley wanted to check whether the Welshman was onside, but a quick review deemed he was and the score was duly awarded.Burns converted to put his side 10 points to the good. The Chiefs were in need of a response and having cut the deficit slightly with a Steenson penalty, it was Burns who gifted the visitors their first try. It was his telegraphed pass to the right that was picked off by Townsend, who was able to intercept and just about make his way to the line for the converted score. Burns made amends just past the half-hour mark when he slotted his second penalty of the game, only for the Chiefs to counter down the other end to claim a second try.Townsend and Kvesic were heavily involved in the build-up, before the ball was worked out to Steenson, whose clever grubber in behind the Bath backline fell invitingly into the path of Armand to dot down. With little to choose between either side at the break, the second half was just four minutes old when Bath regained their slender lead.Cowan-Dickie and former Bath centre Ollie Devoto were both picked out for straying offside and up stepped Burns to administer another successful penalty. But anything Burns could do, so fellow marksman Steenson was equally adept at doing.Dave Ewers released Dave Dennis on a rampaging run through the heart of the Bath defence and when the Aussie was finally collared just shy of the home 22, Townsend looked to instigate another wave of attacks. However, as he positioned himself at the foot of the ruck, Tom Dunn took him off his feet, gifting the visitors a penalty that Steenson was never going to miss. Steenson’s kick took him past the 1,500 point mark for Premiership points and comes just a week after the long-serving fly-half had eased his way past 2,000 league points for the club. The Chiefs had the bit between their teeth and when Rokoduguni was yellow-carded for a deliberate knock-on, they had a momentary numerical advantage with which to play with.Sadly, they could not make it count and it was in fact Bath who nudged back in front when Burns landed a fourth penalty of the game on 53 minutes. It was entertaining fair from both sides as the game headed towards a crucial final quarter. Exeter winger Santiago Cordero came within a whisker of scoring with a dazzling run, when he cut in off the left flank, but just as he seemed to destained to touchdown, he was snagged and eventually pulled up for holding on. Undeterred, Baxter’s braves continued to press forward in numbers.Having twice turned down kickable shots at goal in favour of greater reward in the corner with a line-out, they went once more, this time getting the mechanics in place for a drive that sent Kvesic over for the score.Referee Ridley was again unsure,but a quick conflab with the TMO ruled in favour of the visitors. The natives were less than impressed with that outcome, but they could have no dispute when the Chiefs claimed their all-important bonus point score just minutes later.The Exeter pack again provided the heavy artillery with a succession of attacking raids, before the ball was worked out wide to the right where replacement Whitten, head down, powered his way over from close range.Steenson again obliged with the extras to put his side seven points clear. Bonus point secured, the Chiefs continued their relentless push for greater reward. A solid defensive set not only kept Bath at bay, but when the ball spurted out of a ruck, Slade was the quickest to react. Picking up inside his own 22, the England star set off a rate of knots down field. His speedy charge had him destined for the line before a last-gasp tackle from Darren Atkins tagged him just shy of the whitewash.The visitors were quickly there in numbers and, just as they done for the previous score, they worked it wide where Nowell was waiting to put the seal on a polished performance. Even then there was still time for a late Bath charge, scrum-half Cook racing over in the dying minutes, while highly-rated home winger Joe Cokanasiga was denied a try of his own by some outstanding last-ditch defending from the Chiefs. Mission accomplished, now the Chiefs must rest up over the coming days before bracing themselves for the visit of Irish province Munster to Sandy Park for the first time. Bath: F Burns, S Rokoduguni, J Willison, C Vuna (M Wright 56), J Cokanasiga (D Atkins 58-68), R Priestland (capt, D Atkins 69), M Green (C Cook 67); N Catt (J van Rooyen 68), T Dunn (J Walker 68), H Thomas (A Perenise 68); D Attwood, C Ewels (E Stooke 58); Z Mercer, T Ellis, T Faletau (J Bayliss 67). Chiefs: P Dollman; J Nowell, H Slade (J Simmonds 73), O Devoto (I Whitten 56), S Cordero; G Steenson (capt), S Townsend (J Maunder 73); B Moon (A Hepburn 58), L Cowan-Dickie (J Yeandle 58), H Williams (T Francis 58); D Dennis (O Atkins 56), S Skinner (T Lawday 73); D Ewers, D Armand, M Kvesic.